The 100 Day Home Organization Program - get organized in 2018! The week before Christmas and New Years seems to be a very popular one for organizing judging by the traffic to my site. When Christmas is over we start looking around at all the gifts wondering where in the world we are going to put everything. How many of you plan to make “get organized” a New Year’s resolution next year? A home that you can’t wait to get home to at night and enjoy living in. A home where everything has a place. A home where you feel confident and at peace. A home where you eagerly entertain family and friends. A home that is clutter-free. A home where you pursue your passions. It’s totally possible but sometimes we just need a little help and someone telling us what to do. Well guess what? 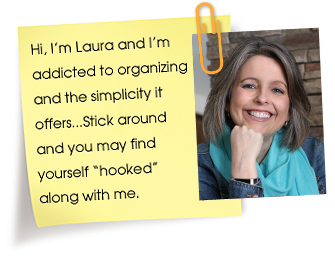 I’ve had the opportunity to check out an organizing program that I think can really help you get a handle on all of your clutter and chaos. If you are the type of person that does well with step by step checklists and accountability, this program is for YOU. Please know that I would never recommend a program I haven’t first checked out myself. The 100 Day Home Organization Program, run by Professional Organizer, Lisa Woodruff, is designed to help you organize the main areas EVERY homeowner has in the order that will make the biggest impact on your daily life. In 100 days!! And Lisa is going to coach you every step of the way and tell you exactly what area to organize next. In addition to daily emails, Lisa will be live in the Facebook group multiple times per week to encourage you and comment on YOUR home. Stop searching and learning. Focus all your efforts on decluttering and organizing your stuff. Many of you will remember Lisa from her guest posts on my site. Her recent one was all about her paper organization routine called, The Sunday Basket. The 100 Day Home Organization Program includes 15 weeks of daily actions to get your home organized. Here is the order you’ll follow. 1..A 1-3 minute video of Lisa’s home and how she has organized the area you are organizing. 2..The daily organizational 15 minute task. 3..Links to any related posts and podcasts Lisa has recorded for that space. 4..Access to direct links to any organizational products you may see in her home. 1..You share pictures in the private Facebook group. 2..Have your questions answered by Lisa in a weekly Facebook LIVE on Mondays. 3. Work through your planners with the group, changing your mindset and your homes together. Yep that’s right. Everyone who signs up gets mailed to them a Productive Home Planner. I love that this is included. Everything is set up and ready to go to make it as easy as possible for you to follow the 100 day plan. If you are ready to live a more organized life, then be sure to check out the 100 Day Home Organization Program to see if it might be the right fit for you. If you are looking around your home and are completely overwhelmed with where to start and all the clutter you see around you, then this program might be something to consider. The reason I’m mentioning it now before Christmas is because registration just opened and is only open until Dec 31/17. The program officially starts on January 1st. If you have any questions that I may be able to help with, please let me know. 6 Responses to The 100 Day Home Organization Program – Get Organized in 2018! Yes on this one there is. When you click through the links you’ll see it there. Oh sorry Julianne, it’s not available at this time. When it comes up again I’ll be sure to let everyone know. Thanks! Wow! That’s a steep cost! I think I’ll stick to organising my home myself and put the money towards making memories with my young family.